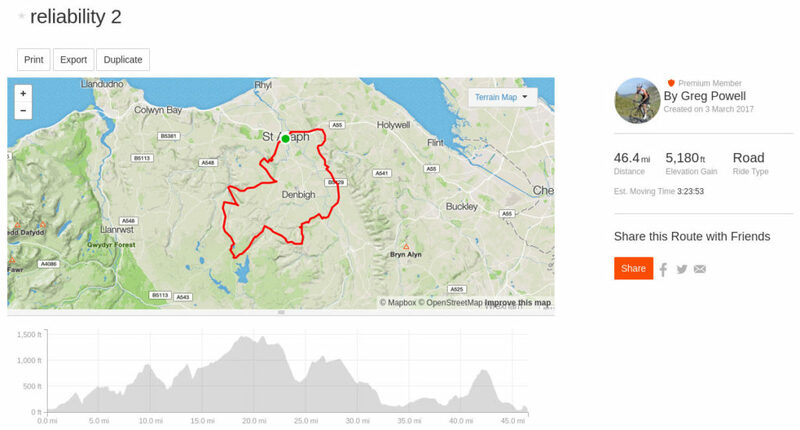 This reliability ride is a challenging, scenic and undulating ride in beautiful North Wales. The route encompasses little known lanes and valleys. The route is 46 miles and 5200ft of climbing. This event has Two objectives: Firstly to raise funds for charity (Breast Cancer). Secondly to enjoy a secluded ride through unspoilt country side affording you the opportunity to assess your fitness levels in anticipation of the season ahead. This term is historic and dates back to the early years of the 20th Century when equipment was less robust, roads poorly sign posted, and mobile phones were none existent. This ride is on Sunday 2nd April 2017, HQ is on Saint Asaph Common, entrance next to Fountain garage LL17 0RF. Sign on from 8.30 am, £5.00 minimum entrance fee (all donations to Charity). Post ride refreshments available. Please make your interest known on the VCM FB Group – along with any questions. With a change to the usual signs or road markings this year we have embraced technology and the route is available via Strava. Many thanks to Greg who has plotted the route for us and saved it as a route on his account. So without further ado here is the VC Meldy 2017 Reliability Trial route.